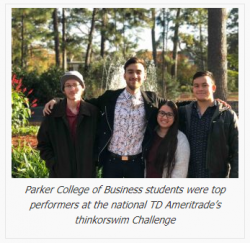 A team of four economics majors at Georgia Southern University’s Parker College of Business recently took fourth place at TD Ameritrade’s thinkorswim Challenge, a real-world cash trading experience, after going head-to-head with 500 college teams from around the country. Handed a portfolio with $500,000 in virtual dollars to trade stocks, options and exchange-traded funds, teams were challenged to put classroom theories into practice and see who could earn the most money with professional-level technology using the paperMoney trading simulator. Students Shaye Escritor, Nathan Insel, Angel Lopez-Akiyama and Layke Touchet, led by Ardakani, invested their funds in equities and financial derivatives. Their group, called Alpha Team Hedge, realized an average return of 187 percent by the end of the challenge. The group outperformed index funds, hedge funds and other teams by using theoretical and empirical knowledge of financial derivatives taught by Ardakani in his financial derivatives course. 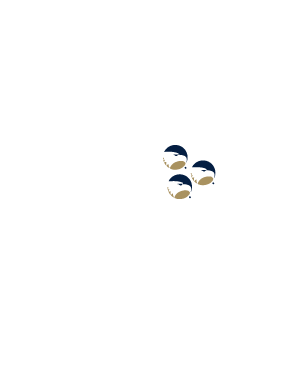 In total, the group was able to grow their initial portfolio to more than $1.4 million. The Department of Economics, housed within the Parker College of Business, provides students with the foundation for careers in business, economics, law, public policy and regional development.